What makes this painting so captivating? In 1961, the Metropolitan Museum paid a staggering 2.3 million dollars to obtain a late work by Rembrandt van Rijn, the painting now called Aristotle with a Bust of Homer. At the time, it was the most money ever paid for an artwork. The painting had taken a circuitous route: from Rembrandt’s studio in Amsterdam to Sicily to London before crossing the Atlantic and finding its home in several private collections prior to auction. Its early travels are well documented, thanks to the survival of shipping manifests and correspondence. The painting now captivates visitors to The Met, as it has captivated generations of art historians who have argued over almost every aspect of the painting. What is it that makes this painting so compelling? The most commonly accepted identification of the subject was first convincingly argued in 1969 by Julius Held and refined in the 2007 Metropolitan Museum catalog of Dutch paintings by Walter Liedtke. Based on a suggestion made by the Dutch art historian Abraham Bredius in the 1930s, Held argued persuasively for the identification of the subject as Aristotle contemplating a bust of the blind ancient Greek poet Homer (who lived some 400 years prior to Aristotle and who is credited as the author of the of the epic poems the Iliad and the Odyssey). The identification as Aristotle is based on the facial features, long hair and beard, jewelry and elaborate dress. They are all comparable with other images of Aristotle produced in both paint and print in the 16th and 17th centuries in both northern and southern Europe. Aristotle was held in high regard not only as a poet and philosopher but also as an important commenter on Homer and the teacher of Alexander the Great. Alexander is said to have counted a volume of Homer’s works as one of his prized possessions. At the time of The Met’s purchase, the subject of the painting was tentatively identified as Aristotle, but was not yet firmly established. This reflects the confusion also recorded in seventeenth-century sources. The painting was originally purchased (and possibly commissioned) by the Sicilian prince Don Antonio Ruffo for the hefty sum of 500 florins. Whether it was a commission or a purchase is unclear, as is exactly what Rembrandt was asked to provide. If it was a commission, the choice of subject must have been left to the painter since when it joined Don Ruffo’s collection it was described as Aristotle or Albertus Magnus (a 13th-century German philosopher). This suggests that even the first owner was uncertain of the subject and that decisions about content must have been made exclusively by Rembrandt. The painting continued to be documented in numerous family inventories until the late 18th century. Over the years, it has been (mis)identified as “a philosopher,” Albertus Magnus, Tasso, Ariosto, Virgil and even the seventeenth-century Dutch poet Pieter Cornelisz Hooft. The identity of the sculpted bust in the composition was similarly unclear. It was sometimes vaguely identified as representing antiquity, and as an attribute of the central figure. That it was intended to represent Homer can be supported in several ways. Almost ten years after his purchase of this painting, Ruffo would go on to commission two more paintings from Rembrandt: a representation of Homer (remnants now in the Mauritshuis) and one of Alexander (now lost). The Mauritshuis Homer fragment (above) shows the blind poet isolated, though in its original format it would have included the students to whom he was speaking. The living poet in this painting is virtually identical to the bust in Aristotle. The shape of the face, the framing of the sightless eyes, and the thin band across his forehead correspond with numerous prototypes and support the firm identification of the bust as Homer. Held has even related it to a specific Hellenistic bust type represented by an example in the Boston Museum of Fine Arts. Rembrandt himself owned a bust of Homer, as it appears in his 1656 bankruptcy inventory. In the painting’s current state, Aristotle is depicted in three-quarter length. His right hand extends to rest on the sculpted bust placed on a table in front of a mountain of books partially hidden by a curtain, but he is not looking at the bust. His eyes are fixed on an invisible point outside the frame of the painting, his dark eyes and absent gaze contributing to a feeling of melancholy and detached reflection. Held associated this melancholy with a passage from Plutarch which recounts that Aristotle had fallen out of favor with Alexander; Liedtke sees the melancholy as an appropriate attribute of a man of learning in the seventeenth century. Aristotle’s clothes seem to belong to no particular period, and Rembrandt has eschewed a more traditional, toga-clad approach such as that found in Raphael’s School of Athens. Aristotle instead seems to wear an odd combination of a wide-brimmed hat, a white tunic, and a dark apron-like garment, adorned not only with a gold chain but earrings and a pinky ringg. The bust itself is painted in such a warm tone that it seems almost more like flesh than stone, putting the venerable poet almost within reach. The two thinkers, living and sculpted, are linked not only by Aristotle’s gesture, but by the repeated arcs created by their clothing and accoutrements. Like much of Rembrandt’s work from the last third of his life, Aristotle with a Bust of Homer uses the rich darkness of the background to set off the central figure, who is gently picked out from the darkness almost as if under a spotlight. Quick, vigorous brushwork creates the voluminous folds of Aristotle’s left sleeve; bright spots of white and light yellow crest to form the shimmering surfaces of the chain draped across his torso. Though the crux of the painting is the interaction between bust and man, the highlights and surface texture carry our attention across Aristotle’s body to his left hand which, accented by a ring, rests on the chain at his hip. The background, by contrast, dissolves into obscure and ambiguous darkness, possibly enhanced over time. Held proposed that here Aristotle ponders the temporality of worldly success as represented by the golden chain versus the more profound and lasting benefit of wisdom gained from art and literature embodied by Homer’s bust. In this sense, the formal repetition of the arc created by Aristotle’s chain and Homer’s sculpted clothing establishes the two figures as counterpoints. Aristotle’s chain bears a medallion featuring a portrait of a man, possibly Alexander the Great. The gifting of gold chains was an ancient practice to recognize excellence and service, and had been revived in the early modern period. It is thus both an historical attribute of the figure and an easily recognizable token of honor for the contemporary viewer. The significance of the chain—both for the subject and in compositional terms—is further made evident through the care with which it was painted. In the Poetics, Aristotle speaks to the power of not just poetry, but imitation—including through the arts. Aristotle, therefore, is supporting the sense of sight as a critical method of learning. In selecting Aristotle as a subject, Rembrandt commemorated the role of vision—of painting itself—as a noble art. By enabling the viewer to take on the Aristotelian role of the one learning by looking, Rembrandt allows the viewer to engage, like Aristotole, in profound thought. In that regard, it was a perfect piece for an educated, thoughtful collector in the Early Modern period and remains an invitation to look and to learn for future generations of visitors to The Met. Rembrandt van Rijn, Aristotle with a Bust of Homer, 1653, oil on canvas, 56 1/2 x 53 3/4″ / 143.5 x 136.5 cm (The Metropolitan Museum of Art). Jonathan Bikker, “Contemplation” in Late Rembrandt, Bikker, Jonathan and Gregor J. M. Weber, eds. Amsterdam: Rijksmuseum, 2015, pp. 215-233. 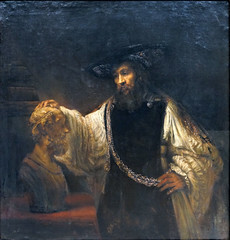 Walter Liedtke, Aristotle with a Bust of Homer, in Dutch Paintings in The Metropolitan Museum of Art (New York, 2007, pp. 629-654). Julius Held, Rembrandt’s Aristotle and other Rembrandt Studies (Princeton: Princeton University Press, 1969). Cite this page as: Dr. Saskia Beranek, "A-Level: Rembrandt, Aristotle with a Bust of Homer," in Smarthistory, July 10, 2017, accessed April 20, 2019, https://smarthistory.org/rembrandt-aristotle-with-a-bust-of-homer-2/.